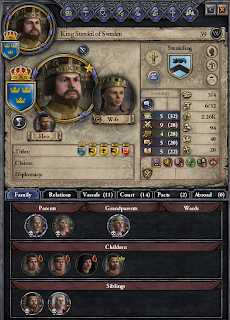 I'm going to want to move to primogeniture eventually, so my first step is to move the laws up to "Low Crown Authority". Also, time to marry off my kids and grandkids. But not to each other (though this game does let me do that). There is a lot of scheming in my court. In particular, people keep murdering my spymasters. 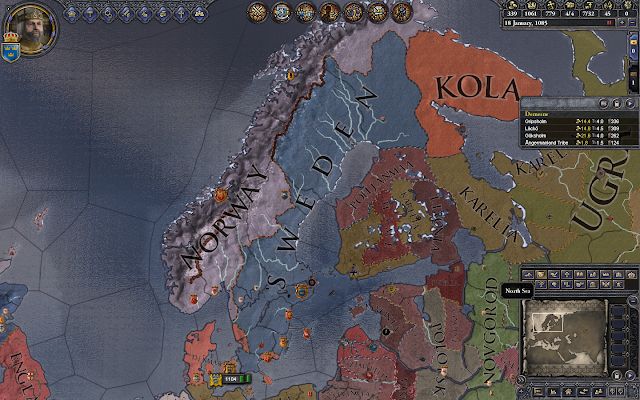 In 1086, my heathen brother-in-law, Prince Erik, goes to war against King Erik of Denmark. I'm going to ignore that, and in Spring 1087, take my conquests to the heathens. Holy War for Kola! The High Chief of Satakunta joins his pagan brother in the war. Good thing I saved up for those mercenaries! The war dragged on to 1089. I was on the brink of victory when I discovered a downside to these Holy Wars. My opponent converted to Catholicism, and the war was over. Hmph. 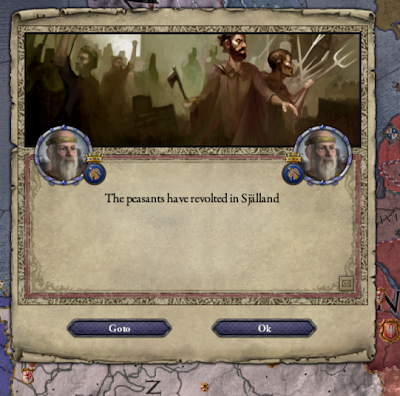 In late 1091, I had to put down a peasant revolt.